Ann Connelly sits near a painting by Celan Bouillet in the Ann Connelly Fine Art gallery. Photo by Jeannie Frey Rhodes. Growing up, Ann Connelly’s slightly bohemian, wholly Japanese mother Seika always had one question for her. But like classic Acadian girls, Connelly and her friends just wanted to dance; to zoom down the back roads between Lafayette and Arnaudville, find some out-of-the-way watering hole, and dance. Whether Seika’s inquiry was mere small talk stemming from her lifelong passion for flowers and trees, or some kind of barometric reading of her energetic, Americanized daughter is debatable. Either way, a teenage Ann Connelly did not spend many hours outside, methodically digging and planting in the yard like her mom. Inside Mary Bird Perkins Cancer Center, another kind of blossoming occurs under the lofty atrium crowned by a cascade of colorful glass rendered by artist Steve Wilson in collaboration with Ann Connelly Fine Art. LSU digital art professor Derick Ostrenko’s “Journey to Wellness” rolls its vibrant animated visuals of a tree sapling flowing down the Mississippi and flourishing in the bayous of Louisiana for the very first time on a chilly evening in February. 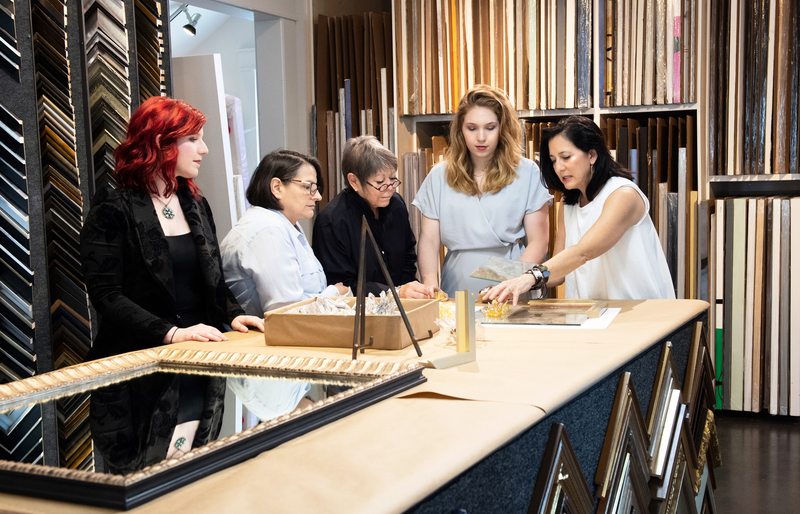 Ostrenko worked closely with Connelly and her gallery’s assistant director Chelsea Norris in every phase of the project—concept, execution and installation. Ann Connelly meets with her staff in an area of the gallery they call the stacks—a room that houses more than 1,500 stretched or framed canvases. An in-house frame shop is essential to this company. Pictured here are (from left) Molly Hauck, Charise Ruiz, Nanci Gaddy, Chelsea Norris and Connelly. Photo by Jeannie Frey Rhodes. From stardust, through difficulty, come firm, deep roots is one message conveyed to a large crowd of donors and supporters celebrating the medical facility that has warmly embraced the power of healing arts, and trusted Connelly as a creative partner in that bold program. Just south one exit down I-10, Connelly’s fingerprints are all over the artwork and design elements being prepped for another medical facility, the new landmark $230-million, 95,000-square-foot Our Lady of the Lake Children’s Hospital slated to open this fall. Previously, her gallery collaborated with Brad Bourgoyne on “In Flight,” his floating installation of birds soaring across the atrium at Woman’s Hospital. Praising her representative’s longtime commitment to work in this arena, Ann Connelly Fine Art artist Elise Toups appreciates the way this public art moves beyond the mere decorative. This is using creativity to overcome chaos. “Beautiful distractions,” Connelly calls them, artwork designed to take patients’ minds off of their pain. Connelly and her team study the space in depth from past to present, brainstorm the possibilities the project budget will allow, and then zero in on the most impactful story and put a call out to their artists. Artwork Connelly helped install at Fishman Haygood includes (opposite) a live mural painted on the ceiling with canvas mural panels by artist KEF!. Photo by Collin Richie. Whether curating for a home or office, Connelly describes her role as more emotionally driven than traditional art placement can be. And to that she brings a high level of conceptualization, ideation and editing. Connelly is fascinated with juxtaposition. She began her career hosting pop-up shows with old European sketches and contemporary work selling side by side. Whether it’s the splashy pop of a Leon Bridges portrait by Covington-based architect and artist Ken Tate, or a giant blow-up of Picasso’s inky sketch Don Quixote transformed into a moody wall covering inside the Commerce Building, Connelly wants emotions as vivid as paint strokes to color the heart. Connelly’s desire for impact has pushed her muse from residential walls into more commercial spaces like the law offices of Phelps Dunbar and Taylor Porter—both given modern art makeovers that also respect the firms’ past and former collections—along with plenty of public-facing exteriors. Inspired by Kevin Harris’ curation of the murals of the Museum of Public Art in Old South Baton Rouge and the community arts work of Rodneyna Hart, Connelly has been instrumental in bringing other European street artists to the city. The acclaimed German artist known as KEF!, under Connelly’s direction, has painted walls at the Commerce Building, the Overpass Merchant and the law offices of Fishman Haygood. Similar to Landry’s evolving taste for office aesthetics, developer Michael Lang knew he needed a deep depth of bold creativity for the living spaces inside his Commerce Building property. While tethering progressive developers, business owners and talented local designers—whom she praises often—to the work of dozens of artists across Louisiana, the South and the world, Connelly has collided with a dense patchwork of the city’s civic leaders and cultural tastemakers in the process. She’s often a soothing bridge between the two disparate classes of the patron and the creative, even as her sights now are set on bringing together the clashing viewpoints of conservative city officials and progressive entrepreneurs. 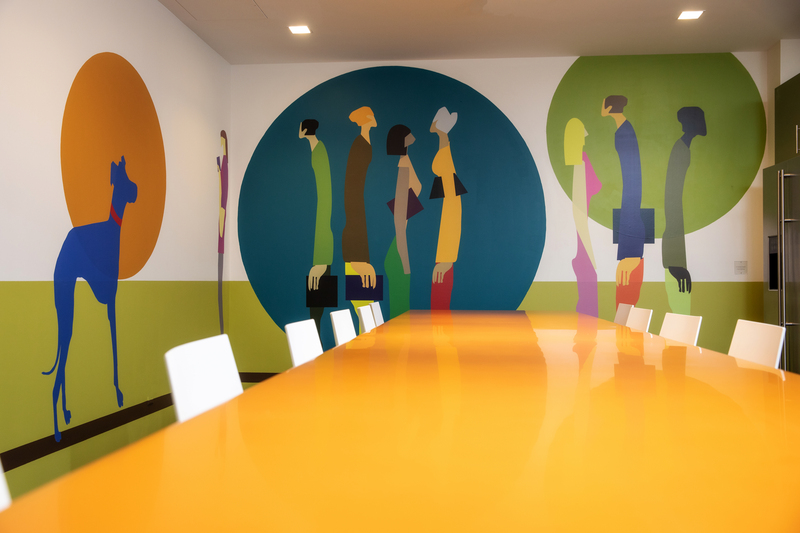 It also includes a hand-painted mural with custom vinyl cutouts (left) by Katherine Lane. Photo by Collin Richie. Connelly grew up fast in the late 1970s and 1980s. Her mother Seika married an engineer working for the Arabian American Oil Company and moved to Dubai when Connelly was just 16. Trips through Europe and Hong Kong to get to the Middle East and see her mother were a revelation of Renaissance, rural Asian, Byzantine and Muslim cultures, artwork and architecture. After serving at an architecture firm—mostly coloring and beautifying presentations, she says—Connelly worked a stint at what is now the Louisiana Art & Science Museum under the museum’s original director, Adalie Brent. Brent was in her 70s, but she mentored Connelly and encouraged her to pursue her passion for representing artists. That was at the end of the 1980s, and after building a strong client base and hosting a series of pop-up events and markets, Connelly opened her first brick-and-mortar gallery in 1998. Married to contractor Paul Connelly and a mom of a daughter and son in their 20s, Connelly is 59 but maintains a steady, youthful energy. It helps her connect easily with young talent. Since she began representing artists in 1990, she has discovered and mentored many creatives in the Baton Rouge community. A decade ago, a rough-and-tumble young artist who describes himself then as a total “street boy” met with Connelly about representation. He was a painter and creating huge, mesmerizing mixed-media work like pieces of modern mythology. 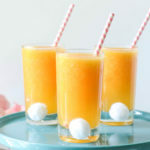 His name? Demond Matsuo. At one point during their first meeting, Matsuo lost his cool, and he stormed out. “It’s nothing Ann did, it was just me being feisty,” he says. 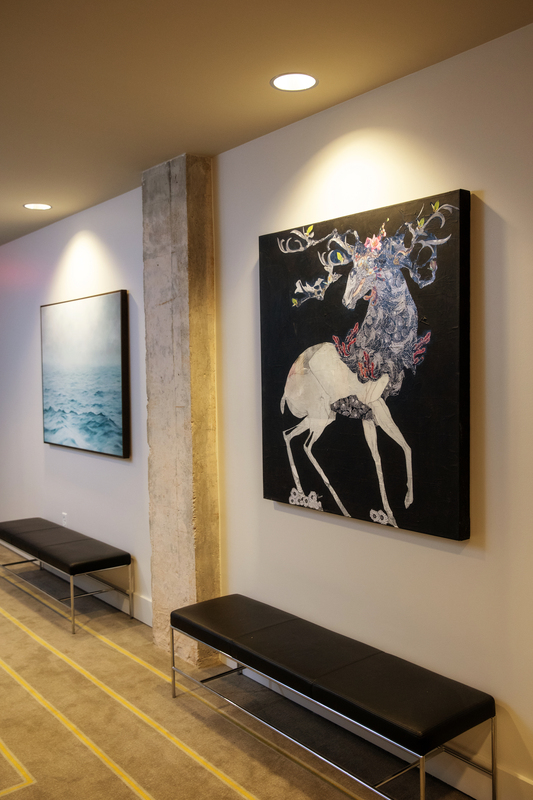 In the Commerce Building, Connelly added works in the residential comon areas including (above) a limited-edition giclee on canvas by Mel DeWees and a mixed-media collage on canvas from the stag series of Demond Matsuo. Photo by Collin Richie. Months later, Matsuo returned to Connelly to apologize. She warmly welcomed him back without hesitation and has sold his work ever since. 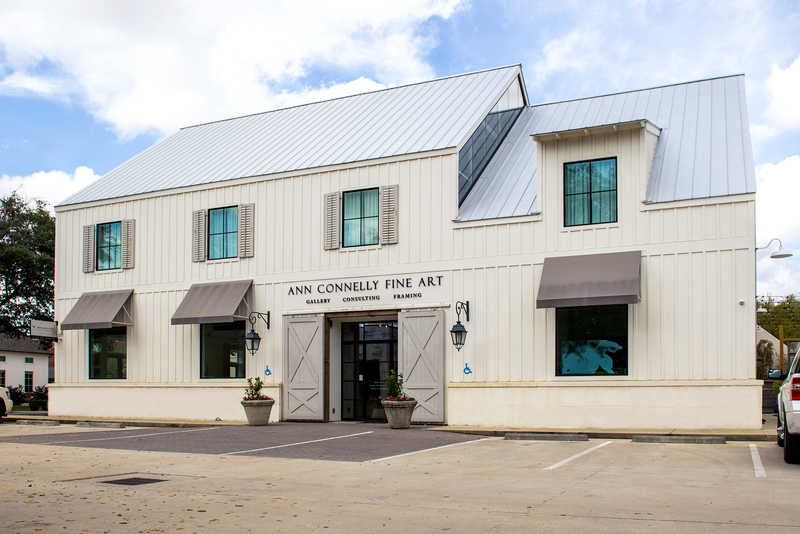 Ann Connelly Fine Art has since grown beyond its namesake, with its founder employing a full-time staff of six, and a few part-time workers and interns. 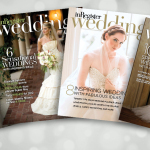 Photographer David Humphreys is both an artist in Connelly’s stable and a good friend. Since early on in both of their careers, Humphreys has observed Ann’s strong desire to protect artists’ work and get them paid on time. It’s her devotion to developing artists and the impact that makes communitywide that Arts Council of Greater Baton Rouge Executive Director Renee Chatelain respects. From fighting for cultural districts to supporting events and putting in work for nonprofits, Connelly does a lot that doesn’t directly promote her gallery. 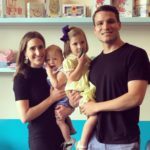 Connelly and her husband Paul developed the Studio Park complex on Lobdell Avenue at Jefferson Highway in 2017 to house her new light-filled gallery space and a handful of other businesses. “I had been interested in the property for years,” Connelly says. 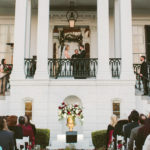 “I loved the location, the beautiful oak trees and the proximity to Mid City and historic Old Goodwood.” Photo by Jeannie Frey Rhodes. 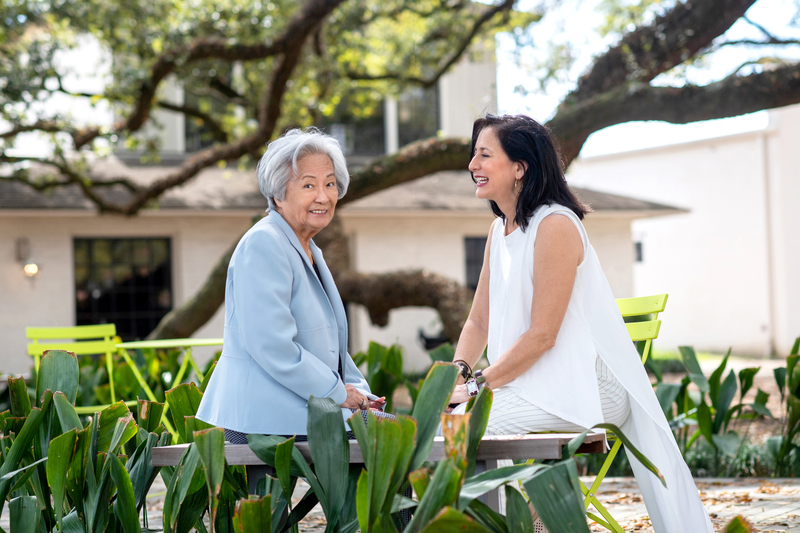 Though the canvas of her impact has now stretched to the OLOL Children’s Hospital, a future cornerstone of pediatric health care for the entire Gulf South, Connelly sees her role in Baton Rouge as far from complete. She wants Baton Rouge leaders to wake up to the many assets art has to offer. A recent Gallup poll ranked social gatherings, openness and aesthetics as the top three attributes that encourage attachment to a city. In short, art connects. Even amid the throng growing inside her gallery for the January opening of Enid Williams and Paul Yanko’s latest work, Connelly floats through the room making time for her many guests. She has a curious habit of calmly saying the name of whomever she’s speaking with before almost everything she says to that person. This can be accompanied by a light touch of the forearm, or a warm pat on the shoulder, and suddenly the din of the crowd melts away. 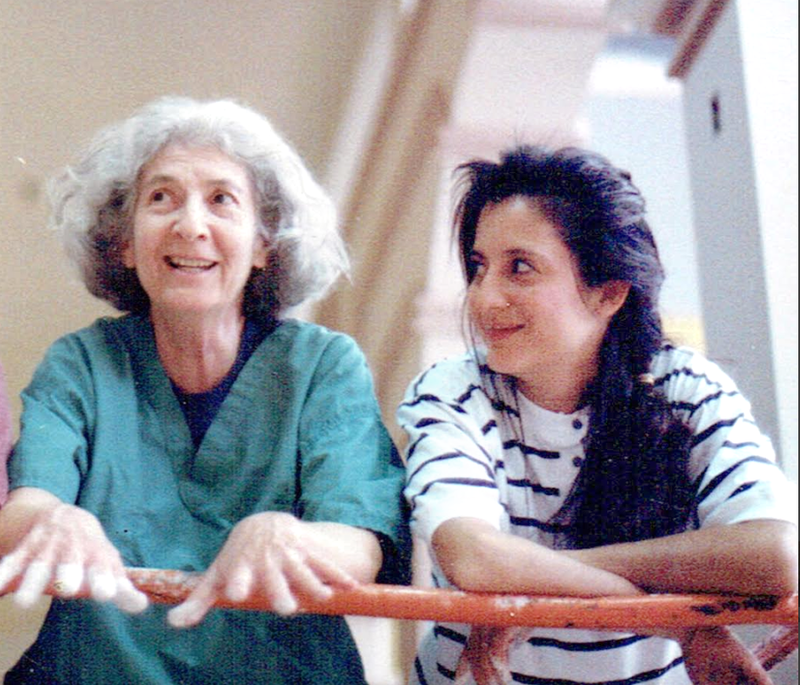 Connelly in 1992 with her early mentor Adelie Brent on a scaffold 20 feet in the air. Photo courtesy Ann Connelly. For Connelly, changing spaces with a narrative vision, challenging a city to evolve aesthetically, and simply chatting with an old friend all start in the same place: a true and graceful relationship. With branches sprawling up and out like thick, Pentecostal arms giving praise to the sky, a massive, preserved bicentennial live oak tree grows at the center of Studio Park, the gorgeous collection of buildings Ann and Paul Connelly built and opened in 2017 off Lobdell Avenue at Jefferson Highway. The land serves as home to her 5,500-square-foot gallery and a smattering of other artistic businesses—with a new arts studio loft and apartment, and the new Martin’s Wine Cellar, opening this summer. Connelly is relaxing beneath the shade of the large oak, a gray, geometric deck zigzagging underfoot. It’s a serene moment for the veteran arts warrior before kicking off another creative meeting with her entire team, her husband and her closest cohort, artist Winifred Ross Reilly. When Studio Park opened in 2015, Connelly dedicated the tree to her mother, Seika. The massive oak outside Connelly’s studio is dedicated to her mother Seika. Photo by Jeannie Frey Rhodes. Perhaps some of that awe is not only for the tree, but for the one who dedicated it to her. The daughter who has given her this kind of garden. Connelly can answer her mother’s question now. The truth is, she has spent 30 years answering it with a life devoted to tending a cultural garden, planting creative seeds, watering the soil for young artists, repairing talent the locusts have tried to eat away, and bringing to harvest an array of creative expression and storytelling that proves rewarding to all who only stop and look in the way that Seika looks upon her tree.